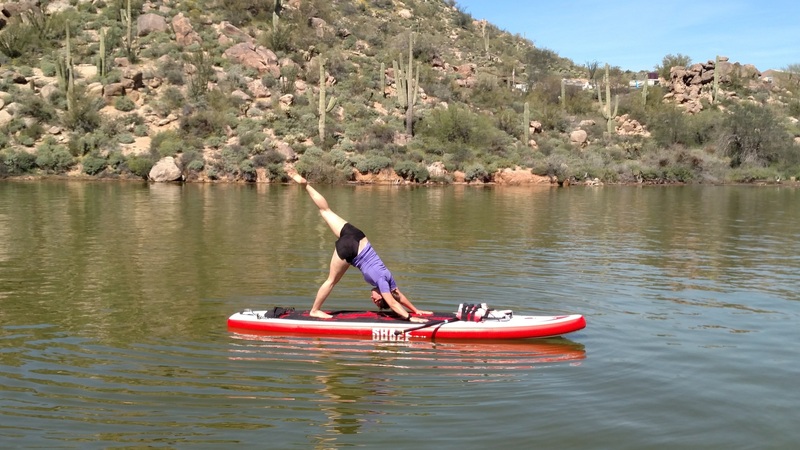 Haley teaches Yoga Classes around the Valley and is excited to now offer StandUp Paddleboard Yoga at Bartlett Lake. These classes are accessible to those who are new to both yoga and paddling, as well as experienced practitioners. After a short paddle, students will be anchored to ensure that everyone stays together and within earshot of the instructor. During class, you can expect to experience guided breathing and traditional yoga postures that have been modified to be more easily performed on the water. All students are encouraged to only do as much as they are comfortable with and modifications are always offered and available. Once instruction has ended, the students are invited to partake in some playtime on the boards and to try anything that was not covered in class. Our next SUP Yoga class will take place in APRIL 21st. Please arrive 30 minutes early to receive your boards and instruction. Go Stand Up Paddle provides all the Stand Up Paddle Board rentals and necessary equipment to get started. No need to transport anything. Just show up before class and we will get you and your classmates on the water in minutes.